The case studies linked below span a wide range of types, including field-based research, analyzing data using instrumentation in lab, short activities, and semester to year-long projects. At the University of Nebraska at Omaha, we have involved students in introductory Geology and Chemistry classes in an interdisciplinary study of drinking water quality. The goals of this project are to introduce the students to the scientific method, get them to actually "do" relevant science, and show how science affects their lives. We have also used this exercise to help some students overcome their fear of science by allowing them to actively learn science, rather than absorb it in a passive fashion. These courses are mainly populated by first or second year students. There is typically a significant population (average 15%) of pre-service elementary and secondary level teacher education majors who take the introductory Geology classes. The majority of students in these courses are non-majors, taking the course to fulfill a natural science requirement. Interestingly, we have been able to attract majors with this exercise. The Chemistry course serves mainly pre-health students, engineering majors, and other STEM area majors. The Hope College REACH (Research Experience Across Cultures) program is a 6-week summer research program in which local high school students and teachers in West Michigan research alongside college students and professors in the college's Natural and Applied Sciences (NAS) Division on timely and relevant scientific problems. improve communication and education relationships between Hope College and the area high school communities. During the summer of 2010, a pilot REACH II team-based research project to survey the bogs of Allegan County was undertaken. Our ultimate research goal was to use paleoenvironmental indicators in the Allegan peat bogs to develop a climate history of the lower Great Lakes region since deglaciation occurred approximately 13,000 years ago. Our first step was a county-wide reconnaissance of the stratigraphy and geologic history of the Allegan County peat bogs. It was this study that was performed by the REACH II team. Students at the University of Montana Western take classes in an immersion scheduling system called Experience One. Students take a single class for five days a week over 18 instructional days (Thomas and Roberts, 2009). The classes meet a minimum of 3 hours per day, but classes can meet for up to 7 hours per day or be off campus on domestic and international trips for part of the course or the entire duration of the course. 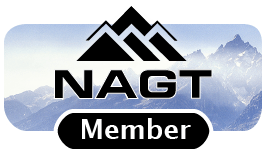 For example, my Environmental Field Studies class meets 7 hours per day and I am taking an introductory physical geology class to Nepal for 3 weeks in the spring of 2013. It is similar to the system used by Colorado College, but we adopted it for the sole purpose of incorporating experiential learning across the university curriculum. How does it work in an introductory course? Most of my introductory courses (e.g., Physical Geology and Environmental Geology) are currently meeting the typical 3 hours per day (i.e., typical of general education courses), and have a mix of lecture, lab and projects. The major project is a quasi-research project entitled "The Rock Project" that was nominated for (but did not receive) the AAAS Inquiry Prize in 2011. It was published in the Journal of Geoscience Education (Thomas, 2001). Field Excursion to the Khumbu Region of Nepal, a course offered in the spring of 2013, will take our Physical Geology class to the Khumbu region of the Nepal Himalayas to learn through experience. We will spend three weeks learning introductory geology with no textbook, no official lectures and no exams. The students will construct a photo journal of the geology, focus on a specific topic of their own to collect data while in Nepal and then present at the UMW Research Symposium, and they will engage in a collected project to assess damage done by a recent 6.9 magnitude earthquake in the area. 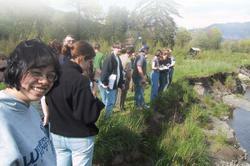 This is a semester-long group research project that uses a local river to integrate several lab and field activities. The project covers topographic maps, rock and mineral identification, measuring data in the field, and plotting data. The project involves multiple lab sections and serves as a focus for a broad introductory class. Course-based undergraduate research experiences (CUREs) are a way to improve the quality of STEM education, attract and retain STEM majors, and provide wide and equitable access to undergraduate research experiences. Several of our courses are designed to provide students with a significant, authentic research experience. For practical and pedagogic reasons, we use collaborative groups in the CUREs. To maximize group function and learning, we intentionally design groups and explicitly discuss expectations. We've used this approach in eight different courses ranging from 100-level (general education) to upper-level to carryout research using our Western Carolina Hydrological Research Station. Here, we highlight our approach to using small groups of students to complete research projects in a 300-level geomorphology course. To support our CUREs, we also use undergraduate research fellows, a hybrid role of a research and teaching assistant. Course-based undergraduate research experiences (CUREs) are increasingly called on as a way to improve the quality of STEM education, attract and retain STEM majors, and provide broad and equitable access to undergraduate research experiences. Several of our courses are designed to provide students with a significant, authentic research experience. We use undergraduate research fellows (URFs) to support and sustain our research-based courses, which range from introductory to upper-level. The fellows have a hybrid role, ranging from technician, to research assistant, to teaching assistant, to research coach/mentor. 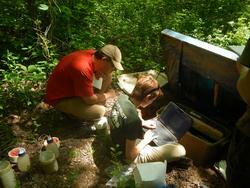 Field research takes place in our Western Carolina Hydrological Research Station. Our CUREs, for the most part, include the elements described by Auchincloss et al. (2014). On three separate visits to Sweden between 2008 and 2011, groups of between two and three Hope College students mapped the geology in the area around the Stensjöstrand Naturreservat in Halland Province, Southwestern Sweden. Their map area is a high-grade, poly-metamorphic, poly-deformational, terrain in the Eastern Segment of the Sveconorwegian Orogen, which is broadly correlative with the Grenville Orogen of North America. This is part of a collaborative project involving scientists from both Lund University and the geological survey of Sweden (Sveriges Geologiska Undersökning or SGU). The geological mapping occurred over three to four week periods in May and early June. The project was funded with a number of small grants with the SGU providing support in the field. The Yellowstone REU Project explored the Precambrian basement exposed in the northern part of Yellowstone Park. 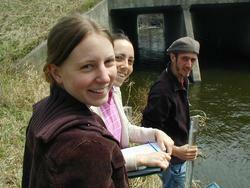 Field studies were conducted with two cohorts of students during the summers of 2010 and 2011. The project goals were to: 1) characterize the igneous and metamorphic petrology, geochemistry, geochronology, sedimentology and structural geology of this unique sequence of Precambrian rocks, 2) integrate these findings with a larger ongoing research effort on the petrogenesis and evolution of Archean continental crust in the Wyoming Province, and for the students, 3) contribute to the professional development of cohorts of students who are ready to pursue the next steps of their careers in graduate school or in the workforce. The following is a summary of the development and implementation of this field program. 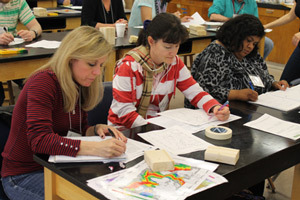 The ability of students to conduct field studies on exposures of rocks, and compile accurate field data, are still essential skills to create geologic maps and unravel the geologic history of a region. The research projects integrated in the Field Research in an Undergraduate Field Camp are intended to get students to engage with the rocks, and use their knowledge and skills to understand and interpret geologic events. The field modules allow students to realize the value of field studies in testing ideas about different aspects of geologic records. The course is required of all students in the program which also allows this course to be used as a capstone assessment of the learning outcomes of the students. Undergraduate research students working with Deanna van Dijk, a physical geographer and faculty member at Calvin College (Grand Rapids, MI), have been monitoring coastal dune processes, variables and changes at a Lake Michigan site from 2000 through the present. To date, 14 undergraduate research students have participated in this research project in summer and academic-year research positions. This case study describes the work of three undergraduate research students who participated from October 2007 through May 2008: Brent Geurink, Luke Pettinga, and Jon Schmitkons. The students participated in setting up and taking down research equipment, making weekly field measurements, data entry, data analysis, and presenting results at a professional conference. One of the goals of my Mineralogy class is to demonstrate how the principles and content covered in class can be applied to questions of geologic interest or that have practical applications to society or industry. This is an early step towards introducing students to authentic research projects. 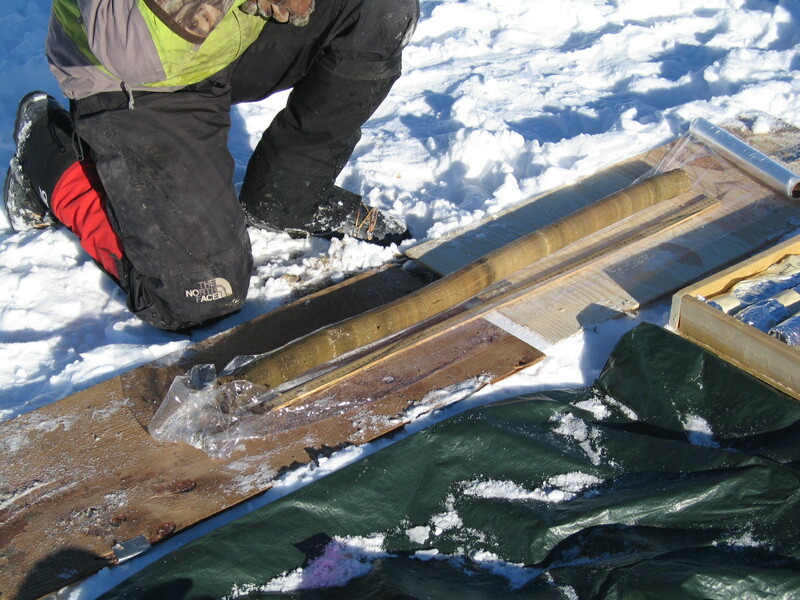 The general theme of these projects is characterization of Earth materials, and typically involves collection of samples in the field (if possible), hand sample observation, petrographic analysis, and further analysis using X-ray powder diffraction and electron beam techniques such as scanning electron microscopy (SEM) and back-scattered electron (BSE) imaging and elemental analysis using energy dispersive spectroscopy (EDS). This module highlights the curricular design and outcomes of undergraduate research in the Department of Geosciences at Fort Lewis College (FLC), supported by an NSF-RUI project (award No. 0911290) on the Navajo volcanic field (NVF). A prime impact of this project was to support the education and career development of undergraduate students by further developing basic knowledge and skills in the context of authentic inquiry on petrologic-based research topics. Integrating research into the curriculum promoted scientific habits of mind by engaging students as "active agents" in discovery, and the creative development and testing of ideas. It also gave students a sense of ownership in the scientific process and knowledge construction. A small group of students from this course continued their research as senior research projects as part of the NSF project. 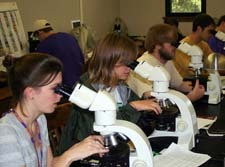 As the core activity of petrology portion of a mineralogy/petrology course, students cooperatively conduct petrographic and electron microprobe analytical studies on suites of Central Blue Ridge metamorphic rocks collected during class field activities. We make use of a remotely operable electron microprobe instrument at the Florida Center for Analytical Electron Microscopy (FCAEM) to conduct all analyses in class. Students cooperatively conduct original research in Marine Geology utilizing marine practices on Lake Champlain, NY - Vermont. The lab section of the course is used to develop and implement a research project. The students are given a research question to solve. To proceed they must first review all available literature and then design a research program. They then implement that program using marine and laboratory equipment that is available to them and report on their outcomes after a semester-long investigation. The pet rock project is a semester-long project in which each student randomly selects an igneous or metamorphic rock from the instructor or brings in a rock from an appropriate locality, and follows all of the steps a petrologist would take to interpret an igneous or metamorphic rock from an unknown area. This project runs in the background of the petrology class during the initial part of the semester while the student acquires the petrologic skills to make more sophisticated interpretations. The culmination of the project is for each student to spend several hours with the instructor using the electron microprobe to identify more difficult minerals with certainty, to produce high quality digital backscattered electron images and to obtain quantitative electron microprobe analyses of selected minerals that aid in the interpretation of the pet rock. The Petrology course at Macalester College is designed around a semester-long project. 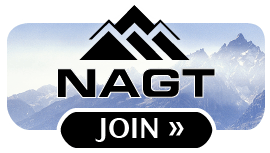 All laboratory and classroom activities within the course are directed toward understanding and solving a real-world problem, the origin and evolution of an intrusion in northern Minnesota. Emphasis is on using multi-disciplinary approaches, modern instrumentation, and student-generated data. After completing the course, students exhibit improved quantitative skills, reasoning, and understanding of fundamental petrologic processes. This web page features a video of a presentation by Greg Hancock, College of William and Mary, describing his course-based research projects related to teaching about surface processes.